Season 7 of My Kitchen Rules came to a close with 1.97m viewers watching Tasia & Gracia triumph in its Winner Announced segment. The bulk of the Grand Final drew 1.82m viewers. It was no contest as Seven dominated viewing last night with an audience share twice its nearest competition. The numbers were slightly down on 2015’s (2.08m / 2.04m -all are preliminary figures) but there will be smiles all round at Jones Bay today. 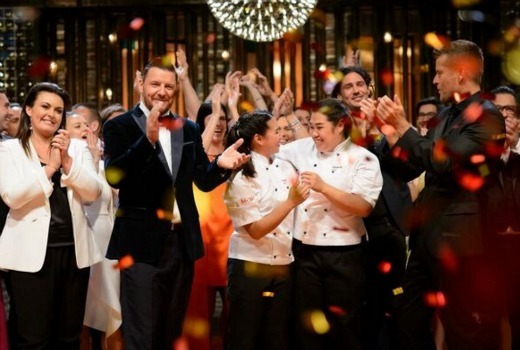 Not many shows were able to hold their head high once MKR began, although ABC shows held well against last week. Bondi Rescue actually lifted for TEN and Territory Cops was on par with last week. A Current Affair managed a timeslot win for Nine but from there it was bad news, culminating in dire numbers for the Reno Rumble grand final. Nine’s primary channel even slipped behind TEN’s into third place. Seven network stormed the night with a 40.5% share followed by Nine 20.0%, TEN 18.3%, ABC 15.5% and SBS 5.7%. Following MKR for Seven were Seven News (1.15m / 1.07m), Home and Away (860,000), Seven Year Switch (786,000) and The Chase (634,000 / 376,000). Nine News (1.09m / 1.07m) led for Nine followed by A Current Affair (918,000), Hot Seat (568,000) and Cats v Dogs: Which Is Best? (421,000). Only 249,000 watched the Reno Rumble Grand Final -a disaster. The Project (593,000 / 488,000) was best for TEN. NCIS drew 570,000, Bondi Rescue was 564,000, Territory Cops was 518,000, TEN Eyewitness News was 514,000 and NCIS: LA was 477,000. ABC News (836,000) was out in front on ABC followed by 7:30 (641,000), Catalyst (565,000), Keeping Australia Alive (459,000), Foreign Correspondent (400,000) and Antiques Roadshow (328,000). On SBS it was Great Continental Railways (281,000) then Insight (208,000), SBS World News (153,000). Dateline was 96,000. ABC2’s Octonauts led multichannels at 256,000. I am very disappointed with Reno Rumble this year. Scott Cam is so annoying and I’m sick and tired of his nonsense. Channel 9, please do not renew this show for 2017. Next year I reckon the MKR Grand Final should be up against the Logies. Also, that has to be one of the highest ever network shares? Anything above 40% is excellent. One of the highest this year yes. Ten was 41.3% on the night the first Masterchef winner was announced in 2009 (strange I could easily find that one! ), I think a bit higher in 2010. Nine had a 45%-ish if I recall on an NRL GF night? 1 Ten 41.8% (network 44.3%). It’s over! Oh my gosh, it has actually finished. Now a chance for 9 and 10 to claw back some ground. I am just glad that garbage has finished! Nine’s biggest non-News/CAFF program for the night was a game show that was on before primetime. More people watched Great Continental Railways on SBS or Octonauts on ABC2 than watched the final of RR. I think that’ll be the final final for RR. I guess like you love You’re Back in the Room, others love MKR. No judgment, TV is a broad church and it appeals to different tastes. if those are the numbers for RenoRumble and people are tired of Reno shows I wonder what the numbers for HouseRules will be. I was one of the people who have watched RenoRumble this season- it was good, hopefully they do another 1 next year. Really good numbers for TodayExtra- looks like the TodayShow and TodayExtra are beating their counterparts on 7. Channel 9’s primary channel in third place ! Whatever happened to “Still the One “. Nines massive judgemental errors this year will make it hard to recover. But then with bankers running the Channel, what else can you expect ! is that ‘bankers’ with a silent “w”? David Gyngell got out just in time!! with his golden handshake,, and cashed out shares!! Burying the Reno Rumble finale against MKR was probably clever in theory, but I suspect most of the media coverage of the results today will highlight how poorly RR did in comparison. You were right. News and Fairfax both went hard on headlines. I thought they might have moved on. I was flicking through the channels and laughed when I saw the “Cats & Dogs” show on Nine. I think they knew it was a lost cause and didn’t even try! Yes, they moved profile content away from MKR and laid low. MKR has had another great run!! But hopefully next season they ditch Colin’s round! And maybe get some new judges?..